We have developed an in-house team experienced with all levels of video capture and production for interviews, short programmes, documentaries and presentations. CSP have a wealth of experience in all aspects of video production and digital content delivery. Project management, pre-planning, capture (both video and audio), editing, digital post-production, animation, digital encoding (both for web and DVD), web development, integration and stable content delivery systems are all covered. Furthermore, an experience and coherent understanding of making digital edition both engaging and optimised for online communities and sharing platforms. Specifically for scientific research projects, we provide a set of multimedia presentation tools to broadcast and disseminate progress and successes, and support project ambassadors with digital materials tailored to captivate target audiences. We can help you storyboard, script, compose, record and produce your video and soundtrack, getting your message to look right and sound right for maximum acceptability with your chosen audience. Output for web and mobile devices. 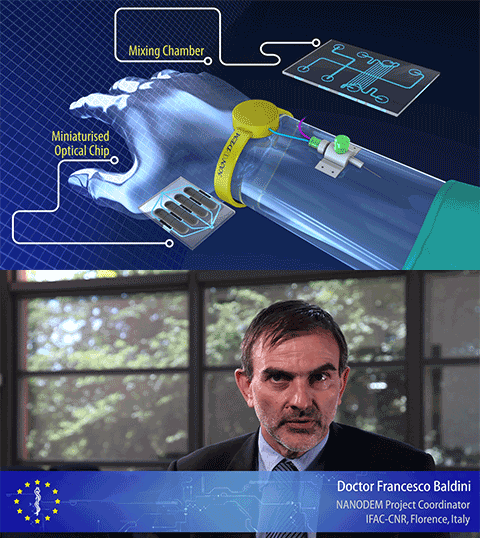 The Nanodem project is developing a revolutionary device, which will change the world of Therapeutic Drug Monitoring. They asked us to tell their story.